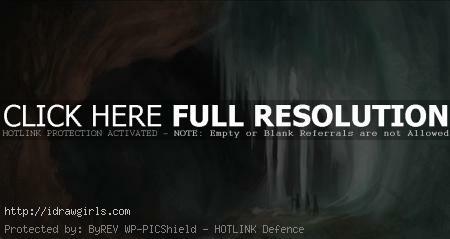 Digital painting tutorial environmental concept crystal cave. Learn to paint environmental concept art crystal cave video tutorial and step by step image with instruction. This step by step video focus mostly on three basic elements of base shapes, blocking in value and color balance. This tutorial demonstrates how to quickly create efficient concept design from concept idea into visual and How to put rough idea onto visual sketch for any aspiring concept artist. In this tutorial, there are slightly different from many of my tutorial. I usually start off with monochromatic, but here I start of with color right away. From base color that I established in the beginning, I then add value and refine them until they get to the shape and form that I am looking for. Watch the video tutorial for more in depth detail instruction. Here is a final painting of crystal cave. 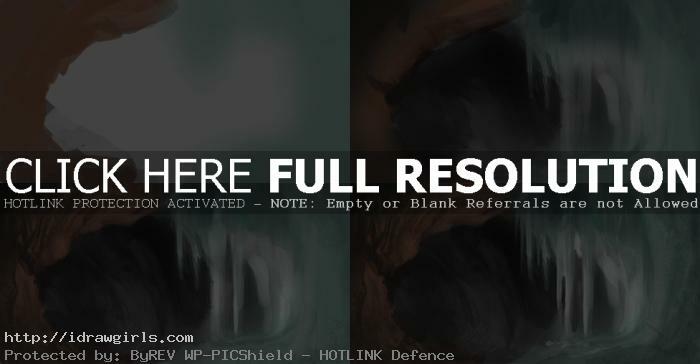 Watch the video tutorial how to draw and paint crystal cave. Below are step by step images painting process to help you with the video instruction. More landscape and environmental tutorials. On Youtube you also mention I’d be able to get the brushes from this page but am unable to find them? I’m currently working on a digital painting of a crystal canyon and am not very experienced with landscapes to begin with, let alone such a background for a painting. This has helped so much with seeing how you render the crystal portion (the white with mostly muted turquoise, and then a little of the more saturated color coming through in places) along with a little texture. Thank you for the fantastic tutorial!